"Dear King of the Leprechauns. I would love to come to Ireland but my daddy doesn't have very much money". The words are on a crumbling, pink letter from 1960, written by an 11-year-old Australian girl, to Irish actor Jimmy O'Dea. 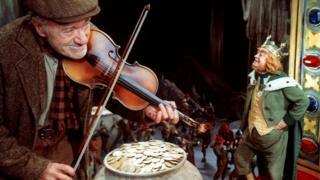 O'Dea was fresh from his role as King Brian, King of the Leprechauns, in Disney's 1959 film Darby O'Gill and the Little People. It is a tale about a wily Irishman and his battle of wits with leprechauns, in a film many believe portrays a romanticised view of Ireland. Sixty years on, the search is on for the letter's author, Patricia Hickson, from Sydney, New South Wales, who, as a child, wanted to go to Ireland. Brían Patrick Doyle from Malahide in Dublin recently discovered its existence and found out that film producer Walt Disney, himself, had seen it. O'Dea, who was from Dublin and died in 1965, had been godfather to Brían's father, Conor. The latter is an Irish theatre historian and inherited a huge collection of O'Dea memorabilia. "My dad has had the letter for donkey's years, but I've only found out about it," Brían told BBC News NI. "He just leaned over and picked this thing out of a drawer, a crumbling letter from this girl called Patricia." Somehow, the letter had been delivered to the Gaiety Theatre in Dublin and O'Dea sent it on to Walt Disney. Disney read it and sent a note back to him. "We still don't know if Jimmy [O'Dea] ever replied to Patricia," Brían added. "But, I couldn't believe it when I saw the letter - I asked if dad had ever tried to find her." "We wonder does she even remember writing it and did she ever hear back from Jimmy? "Does she know that her letter is still around and that it made it to the desk of Walt Disney? We would love to fill her in. "She'd only be about 70 now so there is the possibility we may be able to get in touch." The family decided to take to Twitter to see if someone would know anything about Patricia, and are hoping people will contact them there. Brían has even been in touch with an Australian TV channel which has checked records to see if there are any clues as to where she may be. "Jimmy only made one Disney movie - he made lots of Irish movies but Disney was probably the biggest thing in his career," he said. "Irish theatre history means so much to my dad and we would just love to find her."